The Federal Reserve's massive annual profit, which it turns over to the Treasury, is likely to dwindle and may even disappear entirely in a few years. But that's okay, Fed officials say. After years of record profits, the Fed is likely to be saddled with losses starting in 2017 or 2018, economists predict in a paper that was presented Friday at the U.S. Monetary Policy Forum, a New York conference organized by the University of Chicago Booth School of Business. Here's the scenario they think will play out: As the economy improves, the Fed will eventually tighten monetary policy. The central bank will stop buying mortgage-backed securities and Treasuries by the end of this year, they believe, and start raising interest rates in 2015. Eventually, the Fed will have to start selling off the massive collection of bonds it acquired in its stimulus efforts. And when that time comes, even the Fed admits that it will probably incur losses. Unlike most government agencies, the Federal Reserve funds itself. Its expenses are not paid for in by U.S. federal budget. Each year after paying its own bills, the central bank hands over all its remaining profit to the Treasury Department. Most of the money comes from interest earned on holdings like Treasury bonds and other debt. Those payments have ballooned in recent years. The Fed is earning huge profits from the large bond portfolio it amassed (and continues to amass) during its stimulus efforts. 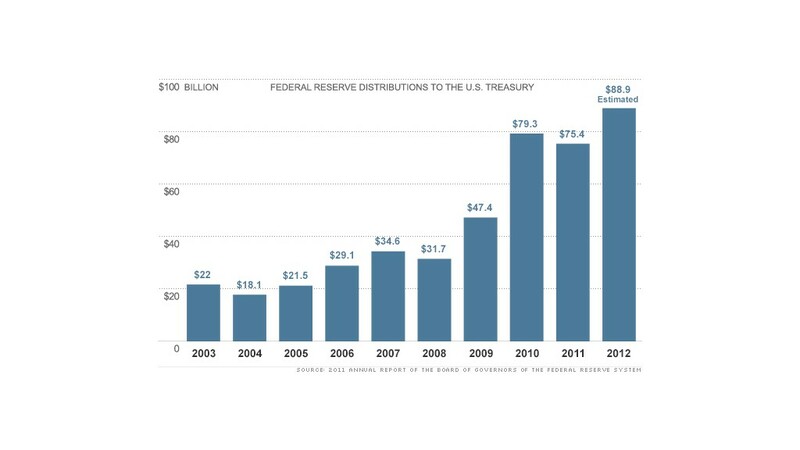 In the decade preceding the Great Recession, the Fed paid out an average of $25 billion a year to the Treasury. In the last three years, its remittances have averaged $81 billion. Based on those numbers, you could call the Fed the most profitable bank in the world. It's generating more income than America's top five banks -- JPMorgan Chase (JPM), Wells Fargo (WFC), Bank of America (BAC), Citigroup (C) and Goldman Sachs (GS) -- combined. Once the economy improves to its liking -- which could still be years away -- the Fed will have to start shrinking its portfolio, to ward off rapid inflation. As the economy gets better, the Fed will raise interest rates. At the same time, bond prices will probably fall as the Fed sells off massive amounts of them. That means the central bank is likely to lose money. That's not necessarily a problem. A relatively new accounting rule would allow the Fed to pay for its operations and make interest payments basically on credit, deferring its losses and paying them off later in profitable years. The situation could easily become a public relations nightmare, though -- especially in the current political environment. "We're in a period where the attacks on the Federal Reserve system are the worst I've seen in 40 years," said Frederic Mishkin, a former Fed governor who is now a professor at Columbia University. "In any year where the Fed is not giving remittances back to the Treasury, this is going to come up big time in Congress," he added. St. Louis Fed President James Bullard also calls it a "recipe for political problems." During the same period that the Fed will incur losses, the government will be paying billions of dollars in interest to foreign governments. The Fed seems to be trying to get ahead of the PR blow-up. The central bank put out a research paper on the topic last month, and minutes released earlier this week show the issue was discussed at the Fed's January meeting. Since then, several officials have spoken about it quite openly. "There is a chance that we could go through a period of time in which our income falls, and we could even take losses," said Janet Yellen, vice-chair of the Federal Reserve Board, in a speech last week. Her colleague Jerome Powell, a Fed governor, reiterated that point Friday. Some Fed watchers expect Fed Chairman Ben Bernanke to discuss the topic when he speaks before Congress next week in his semi-annual testimony. He's stuck in a "damned if you do, damned if you don't" position. If the economy improves, great -- but when it does, the Fed has big losses and a PR crisis to look forward to.